For these and other typical bamboo construction applications, SBPs and EBPs are available in two grades: exterior grade and structural grade. Solid exterior grade EBP may be specified in 07, such as 07412 (wall panels) of the Construction Specifications Institute (CSI) Manual of Practice and MasterFormat. For structural grade SBPs, the specification is typically within division 06, the section that also accommodates parallel-strand lumber, glue-laminated beams, engineered wood products and structural timber, and rough carpentry, among others. Standards, such as ASTM sD5456: Standard Specification for Evaluation of Structural Composite Lumber, apply to cellulosic materials used for structures, including engineered bamboo, such as for these structural beams used at an Illinois airport. Today, instead of referencing only traditional wood species used for solid sawn lumber, D5456 has been revised to include bamboo as another lignocellulosic fiber material—in other words, biomass—that can be used in the manufacture of these products. The historic addition of bamboo to the standard came in the 2012 edition of the Annual Book of ASTM Standards, listing LVB as a certified product for structural applications under ASTM 11a 5456, with the heading “Evaluation of Structural Composite Lumber Products.” At the time, the broadening of the standard was hailed by some sustainability advocates and others interested in increased use of rapidly renewable resources, such as bamboo. In fact, it was the first addition in more than three decades of a bio-based structural material to the ASTM annual compendium. While the ASTM standards added to the appeal of EBPs, the International Code Council (ICC) had already intoned on use of engineered bamboo for structural applications. In a 2009 meeting in Birmingham, Alabama, a vote passed to make LVB a newly ICC accredited product for the following year. Engineered bamboo had been used for years as a finish product, including widespread adoption for wood-look flooring. Prior to that, the product category had its own criteria, AC162: Structural Bamboo, released in March 2000 with test methods, allowable design stress criteria, and other design considerations. This was the first codes document to recommend ASTM D5456 as a quality-control standard. It also provides reference to the International Network for Bamboo and Rattan (INBAR) Standard for Determination of Physical and Mechanical Properties of Bamboo. It is valuable to note that the novel engineered structural component products made with bamboo culm do not perform identically to those made from traditional wood species. The bamboo-based products tend to have better dimensional stability than engineered wood, while their greater density also increases thermal transfer slightly over their wood-based cousins. 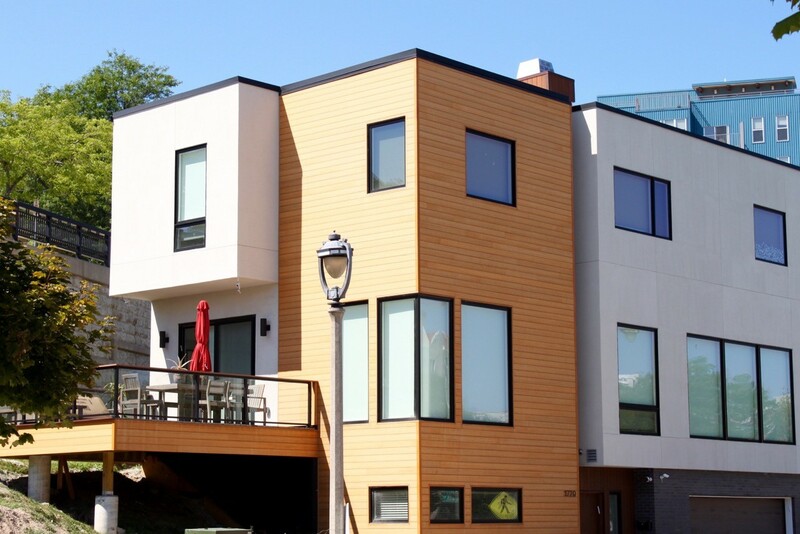 With bamboo-based structural elements readily employed as glulams, LVL, and structural composite lumber, architects and project teams have increasingly designed facade systems, such as cladding, storefronts, and curtain walls, using SBPs. Among the most promising approaches for storefronts and curtain walls is a thermally high-performance hybrid of extruded aluminum framing attached to SBP members for vertical members, mullions, muntins, and horizontal rails. Although non-load bearing as with all curtain walls, as a backup system, these hybrid members support the weight of the glass framing, effectively transferring that weight back to the structure. The engineered bamboo members are generally left exposed, which is ideal for the aesthetic characteristics of the materials. A variety of companies have begun utilizing SBP members into their product offerings to the glazing market. In curtain wall systems, glazing can be secured to hybrid aluminum and EBP backup systems using a captured glazing, structural silicone, and point-support systems. 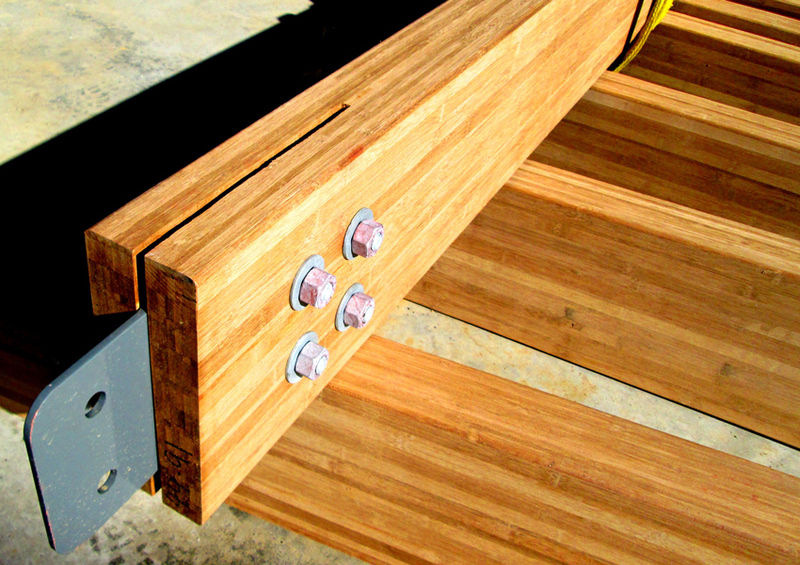 Mullion caps of profiled aluminum or engineered bamboo provide a finished look. In these curtain wall systems, the glazing can be secured to the hybrid aluminum and SBP backup systems using a variety of typical approaches, including captured glazing, structural silicone, and point-support systems. Mullion caps of profiled aluminum or engineered bamboo provide a finished look, inside and out. 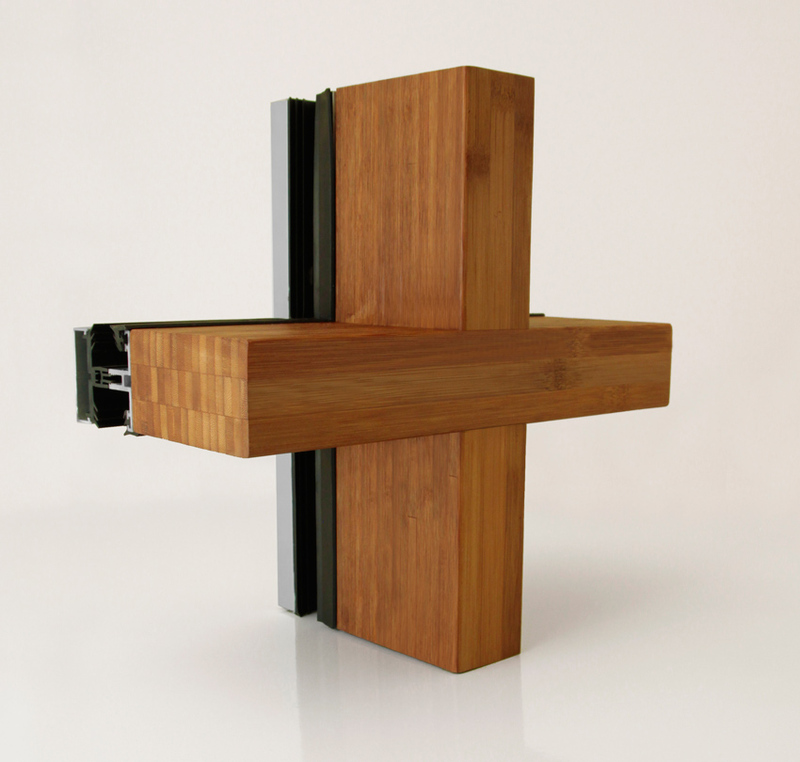 In fact, the bamboo members replace a large portion of the aluminum typically associated with window walls, storefronts, and curtain wall systems—and they can replace the backup supports as well. The result is a wood-hued bamboo grid, with its pleasing texture and warmth. Recent projects have included a split-mullion design by one architect, adding a unique and complex look to the SBP members in the curtain wall grid. Instead of a solid mullion, the vertical members appear as two side-by-side lengths of engineered bamboo separated by a 1-inch or 2-inch gap. Door details by some millwork and window makers have also been tailored to complement the clean sightlines of recent curtain wall designs. Expanding this design language with a more consistent materials palette, some architects have used matching sunscreens and shading devices of engineered bamboo to complement the storefronts and curtain walls. Others have added trellises, pergolas, and other matching EBP structures and finishes. In some cases, the curtain wall and storefront systems are matched with load-bearing columns of structural bamboo in front of or behind the facade. High-performance laminated bamboo is applied to beams, glulam members, exposed trusses, and hybrid steel/SBP assemblies. Engineered bamboo facades can be matched with sunscreens and shading devices of the same materials, as well as load-bearing columns, beams, glulam members, exposed trusses, and hybrid steel/SBP assemblies. In general, these structural elements compare favorably with lumber, plywood, and wood composite products. SBPs have comparable strength properties to other hardwoods but offer better dimensional stability as well as contemporary aesthetics and sustainable characteristics not found in traditional or exotic woods and other engineered products. With further developments in exterior treatments as well as adhesives and binders, SBPs are expanding in areas well beyond where traditional soft and hard woods can be utilized. In terms of pest resistance, testing has indicated that bamboo processed with borate pressure treating prior to lamination records 100 percent termite mortality. Durability against wood-destroying fungi is very high due to the inherent antimicrobial properties of bamboo, with some variation expected based on proprietary treatment and curing processes employed. Many of the EBPs and SBPs are indigestible to insects and microorganisms, helping improve their durability and resiliency. Due to the aesthetic characteristics of the materials, engineered bamboo is best utilized in situations where it is left exposed. This is a key advantage in regard to cost associated with additional labor and materials now not needed to cover up the exposed materials as done with typical wood glulam beams or structural members. SBPs have already appeared in the window and door industry, where structural stability is a must. This allows window and door manufacturers the capability of producing dimensionally stable members that meet a broad range of project needs. With these offerings, EBP and SBP have found a following among architects working in both residential and commercial building types.